If you remember a little while ago (not really that long ago), I did a review of the Boon Animal Bag that I received from CSNstores.com. I've worked with them in the past too, and I will continue to do so on a regular basis now. This time I decided instead of choosing something for myself to review, I thought that you, my lovely readers, would enjoy picking something out for yourself from CSN. I have a gift certificate from them to give to one lucky winner. I've always been impressed with CSNstores. They have such a variety of things from headboards to mailboxes to strollers to shoes. And I've learned that they are adding more things all the time. 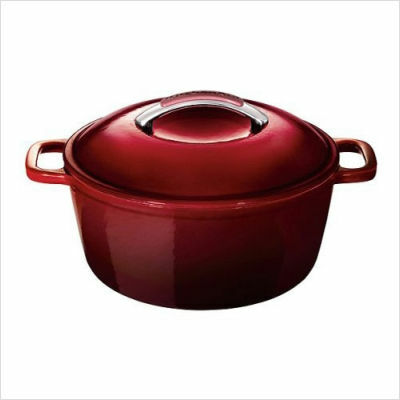 A KitchenAid Cookware Cast Iron 4.5 Quart Covered Round Dutch Oven in Garnet- It's so pretty, and every time I see The Pioneer Woman using a Dutch oven I wish I had one. 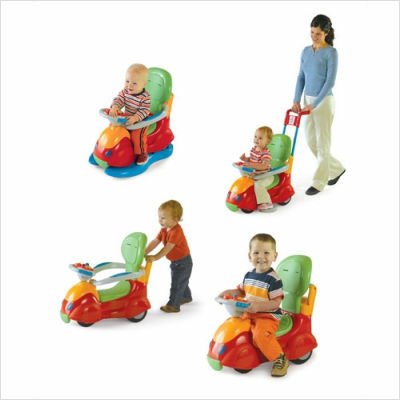 Chicco Four in One Ride-On Car- This would be perfect for my two little nephews very soon. Fun! Or how about a Uniflame 24" Black Fire Bowl w/Foldable Legs- How fun would this be to have friends over or take it along to their house for the upcoming weekend holiday celebrations. 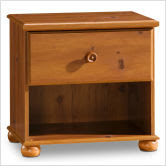 South Show Sand Castle Nightstand in Sunny Pine- It's a great nightstand that would go well in any bedroom, plus they have other colors and varieties similar too. Whatever you like, I know there is something for everyone with CSN. And lucky for you, you'll have lots of chances to win the gift certificate. Read all the rules and ways on entry below. Buy It: All of the items featured here are available from a variety of CSNstores. Win It: There is an $80.00 CSN gift certificate up for grabs. Extra Entries: If you'd like to, you may earn extra entries for doing each of the following. Be sure to leave a separate comment for each. You must do the above (main) entry first, and then you can do these others. *Subscribe to this blog by RSS feed or feed reader. *Subscribe to this blog by e-mail. *Enter one of my other giveaways, then come back here and let me know which on you entered. You may do this for only one extra entry (meaning you don't get an entry for each giveaway you enter). This giveaway is open now through Sunday, July 25th. I will post a winner on Monday, July 26th. I would get the Britax Blink Stroller. I would LOVE!!! to get the CucinaPro Imperia Home Pasta Machine. I have been looking at food processers to help make canning veggies from my garden as easier process. I think 80 would go a long way. I am following you on NB! I like your fan page on fb! I like your fan page on fb. I would love to purchase the Texas shelves with pegs! I'd get the The Rug Market Polka Dots Pink Rug - 11408 for my little girls nursery. I would use it to purchase an area rug for the living room. I'm a follower, entry 1. I am a follower of your blog, entry 2. I follow you with networked blogs, entry 1. I follow you with networked blogs, entry 2. That GARNET DUTCH OVEN is SO PERFECT!! Garnet is my birthstone AND favorite color... My kitchen has LOTS of it and that is SO PRETTY!! I want the Amy Michelle Gladiola Diaper Bag/Tote in Eggplant Faux Patent. I like PS Mom Reviews on facebook. I like Mom Reviews via networked blogger. I follow with networked blogger. I like one of the Paula Deen cookware sets. It looks like I already Like you on FB! I'm Liking you as Judy Weber. I Like you on FB as Judy Weber. While I know I should purchase a set of sheets for my bedroom or some dinnerware, I saw the Elaine Turner shoes of Marlie in Camel and I fell in love. I have entered the Muffin & Mayhem Book giveaway. I would probably spend a little bit of my money too and get my daughter one of the table and chair sets. I would buy a little play kitchen and a couple puppets for the kiddos!I got my fingers crossed to win! Thanx for following me at Esther's Blog. You did not mention if you're entering the giveaway, so I'm taking it that you are. God bless you and I am following you now. Hi Sarah, thanks for following me, I'm following you back...boy, this blog makes a girl want to spend her money! My baby is turning one next month, and he is such a musical lover that I think I'd choose the Schoenhut My First Piano II. I would buy a neww bookshelf or maybe a futon! I subscribed to the feed reader via google. Your button is on my blog Frugality Is Free. I would like this camping chair! #2 I'm a Google Friend Follower! holy smokes, that's a lot of entries! I'd buy my little guy a pair of robeez, then some shoes for the bigger two, too! 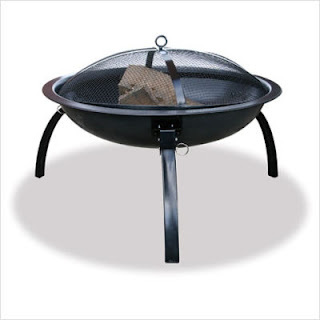 My dream would to put it towards the Le Creuset 5.5-Quart Round French Oven. I might just have to get the dutch oven!! And I just tweeted it. I am a GFC follower ! I'd use it towards a headboard. We don't have one and it's sad!